The Swiss thin-film production line maker says using zinc oxide instead of tin-oxide and increasing output, raises its Amorph High Performance line's capacity by 50 percent. Zinc oxide. It's all the rage, says equipment maker Oerlikon Solar. The Switzerland-based company has improved the underlying technology in its "Amorph High Performance" fabrication system by replacing a transparent conducting layer made of tin oxide with one made of zinc, said Chris O'Brien, Oerlikon's head of market development in North America. Swapping the tin oxide layer for zinc means that the efficiency of amorphous silicon solar cells coming off of this manufacturing module are 7 percent efficient, higher than the 6+ percent efficiency of the tin lines. The zinc layer boosts the panels' ability to capture light more effectively. 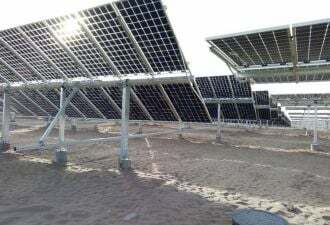 That, along with an improvement in the speed of production, should bring the cost of making solar panels on this fabrication system from about $1.50 per watt to about $1.20 per watt for customers, he said. The company's goal is to get to the magic $1 per watt or less figure in "the next couple of years." Like Applied Materials Inc. Oerlikon is marketing complete solar-factories-in-a-box. Oerlikon doesn't construct the building, but it sells all of the equipment necessary to produce solar cells. The lines are even pre-certified to save its customers some bureaucratic tasks. Oerlikon's customers, however, are currently producing solar panels in factories based on its pre-fab fabs. Schott Solar, Ersol and CMC Magnetics Corp. subsidiary Sun Well Solar – have produced about 500,000 modules on the lines, or the equivalent of about 6 megawatts of generating capacity, O'Brien said (see Sun Well Rolls Out Thin-Film Panels). Along with the Amorph line, Oerlikon also sells a turnkey fabrication system for multicrystalline thin-film solar cells. The panels of the "Micromorph" system achieve a 9.3 percent efficiency. Oerlikon's goal is to raise it to 10 percent by 2010. A total of 10 companies have bought Oerlikon's solar panel manufacturing lines, with an estimated total production capacity of 280 megawatts this year and about 1 gigawatt by 2010, according to a Greentech Media report on the thin-film solar industry. Applied Materials (NSDQ: AMAT) has sold its SunFab line to 13 customers, for a total estimated production capacity of 270 megawatts this year and 1.9 gigawatts by 2010, according to Greentech Media's thin-film report. However, most of these factories have yet to be built. Signet, the first to produce panels on Applied's turnkey system, just started volume production last month. Applied Materials' customers include Abu Dhabi's Masdar Initiative (see Green Light post), ENN Solar Energy CO. Ltd. (see ENN Solar Gets $136M From World Bank Member), Best Solar (see LDK CEO Starts Thin-Film Firm) and Suntech Power. So far, one customer, Signet Solar, has announced that it has started production on its SunFab line with a 20-megawatt annual capacity (see Signet to Start Thin-Film Solar Production). Both Oerlikon and Applied Materials are seen as competitors with thin-film leader First Solar (NSDQ: FSLR), which has the capacity to produce more than 300 megawatts of its cadmium-telluride films annually and plans to exceed a gigawatt of capacity by 2010 (see Thin Film Solar Production to Leap Forward, Shell's Showa Solar Plans 1-Gigawatt Plant and Thin Films Lead U.S. Solar Production). Oerlikon's new lines also have received certification from testing organization TÜV Rheinland, which means customers using them will be able to cut the time they take to certify their panels by several months, O'Brien said.